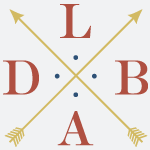 L'Ecole Des Beaux Arts — LDBA Tote Bag! Green logo on natural Red logo on natural SOLD OUT!! An organic cotton market tote with our LDBA logo. Available in one size. Durable, attractive and waiting for you to pack it full for the beach, farmer's market or out on the town!